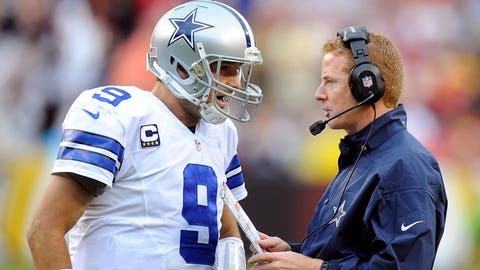 Did Tony Romo save Jason Garrett's job on Sunday? After nearly 59 minutes of play, the Cowboys had one final chance to either survive another week or watch their postseason hopes go by the wayside. On fourth-and-10 at the Redskins’ 10-yard line, Romo took the snap, maneuvered inside the pocket, slid right and fired a strike to DeMarco Murray. The third-year running back caught the pass and spun into the end zone for a score. The touchdown erased a lackluster second half, which included special teams and offensive turnovers and mistakes on defense. It sets up a scenario, after the Eagles’ 54-11 win over the Bears, of a winner-take-all battle for the NFC East title next week. The loser heads home. There’s nothing like the playoffs a week early. “We want Dallas,” the Eagles’ home crowd chanted emphatically in the fourth quarter at Lincoln Financial Field. The Cowboys are more than fortunate to be in this situation after an ugly two weeks, which included a second-half meltdown for the ages against the Packers in Week 15. Romo will undergo an MRI on his back on Monday. Although it shouldn’t alter his availability for Week 17, he’ll need every rep in practice to prepare for a much-improved Eagles defense. 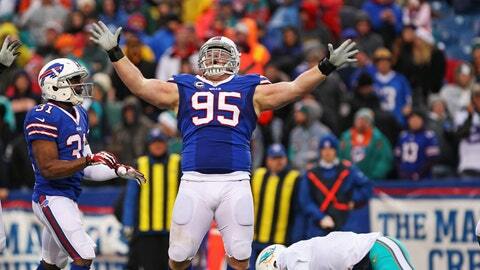 Kyle Williams had two of the Bills’ seven sacks on Ryan Tannehill. Amid a three-game winning streak and Joe Philbin garnering Coach of the Year attention, the Dolphins were able to only move the football for 103 total yards against the Bills. Ryan Tannehill, who left the game briefly with a knee injury, completed just 10 of 27 passes for 82 yards. It didn’t help that he was sacked seven times by a feisty Buffalo defense. Tannehill had only been sacked seven times over his previous three games. The Dolphins still could get into the postseason with a Week 17 victory against the Jets — depending on other results — but could have given themselves a significant advantage with a win. The Lions, who started the season 6-3, aren’t as fortunate, as they lost for the fifth time in their last six games. Giants cornerback Will Hill picked off Matthew Stafford and returned it 38 yards to the house. It knotted the game at 20 and forced overtime. The G-Men ended up kicking the game-winning field goal in the extra frame. The loss will surely bring head coach Jim Schwartz’s job security into question. While it wouldn’t be popular with the local fans, ownership should consider how far he has brought this team. When Schwartz inherited the job in 2009, he took over a team that was winless and had little hope. You can’t justify losing a hold on the NFC North when two of the teams they were competing against lost their starting quarterbacks for chunks of the season, but they must weigh their options before acting impulsively. 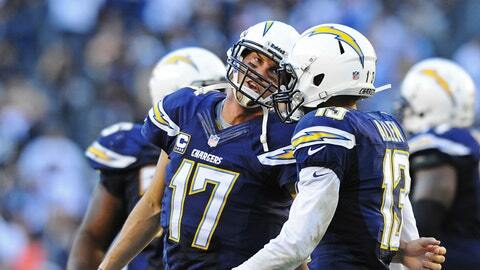 Does Philip Rivers have the Comeback Player of the Year award waiting for him? The Dolphins couldn’t handle business. Neither could the defending champion Ravens against New England. But the Chargers have somehow put themselves into contention over the last three weeks. Philip Rivers, the likely winner of Comeback Player of the Year, didn’t have a spectacular performance. He did, however, hook up with Keenan Allen for a touchdown in the third quarter, giving the latter five scores over his last three games. The Chargers will need help if they have hopes of advancing to the postseason. First, they’ll need to beat the Chiefs, who lost to the Colts on Sunday. Then, the Dolphins must lose to the Jets and the Ravens need to fall to the Bengals. It’s a long shot, but it could be done. If anything, first-year head coach Mike McCoy has done a great job of playing to his team’s strengths. Nothing is more indicative of his influence than Ryan Mathews’ season. Mathews, who reportedly left Sunday’s game in a walking boot, has run for 1,111 yards and six touchdowns in 2013. With one more win, the Panthers will have a first-round bye. 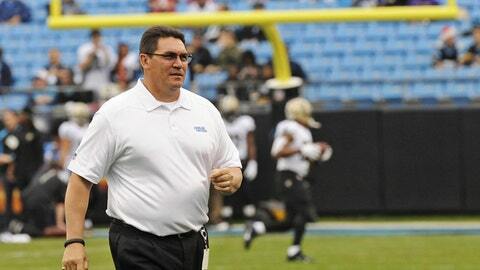 Head coach Ron Rivera entered this season on the hot seat. He might ink an extension this offseason as he enters the final year of his contract. The Panthers continue to rank near the top of every major defensive category and are led by second-year linebacker Luke Kuechly. Kuechly’s 24 tackles on Sunday tied an NFL record, matching former Jets linebacker David Harris, who notched the mark in 2007. But it was the Panthers offense that responded when they needed it most. Cam Newton orchestrated a five-play, 65-yard scoring drive that took just 32 seconds. Newton found Domenik Hixon for the go-ahead score and the Saints weren’t able to respond. It’s a crucial blow for the Saints, because they’ve proven to not be the same team on the road (3-5 away) that they are at home this year. The Broncos were able to clinch a first-round bye and the AFC West crown for the second consecutive season. Peyton Manning’s historic year was summed up by throwing three fourth-quarter touchdowns to reach 51 on the season, which breaks Tom Brady’s single-season TD record. The Bills’ shutout over the Dolphins benefited the Patriots, who have taken the AFC East crown the past five seasons. It’s pretty remarkable how consistent this franchise is when parity consumes the league. Cincinnati also took home back-to-back division titles with its 42-14 romp against the Vikings.